Governor Pat McCrory is now sneaking into North Carolina cities in order to avoid coming face-to-face with citizens who have a problem with his administration. With only two hours notice, McCrory suddenly swooped into Asheville yesterday to take the microphone before a safe audience, the Council of Independent Business, and to pretend that he's actually running the economic policy show instead of Art Pope and a bunch of other Republican leaders who've been busy engineering rewards for the rich people. 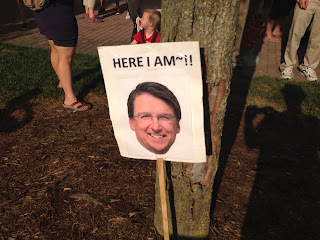 Protesters against McCrory showed up anyway across the street from Magnolia's in what is becoming a regular feature of The Guv's unhappy life in state government -- people holding up signs and calling him out on decisions he's made gone along with. By the "people" he says he's trying to get "back into jobs," we assume he's referring to his 24-year-old campaign operatives that got $80,000+ jobs in the McCrory administration, because we haven't noticed any other jobs coming to North Carolina and certainly not via McCrory's policies.